The Science Manager of Biosecurity Queensland’s fire ant program warned in October 2016, that Australia could lose the war against the super-pest, red imported fire ants, if the Commonwealth did not give the program more money. http://onlinelibrary.wiley.com/doi/10.1111/emr.12238/pdf With his long association with the Queensland fire ant program, the Science Manager would know that Queensland lost the war against fire ants in June 2001 when Minister Henry Palaszczuk rejected scientific advice in favour of pursuing a short-term political agenda. Queensland lost the war on fire ants at that moment and has never recovered. Fire ants now infest an area more than ten times what it was in 2001 and are out of control. Minister Palaszczuk and all subsequent Ministers need to be held to account for failing to administer legislation that makes it illegal to spread fire ants and for wasting $350m of public money on a chaotic program that can neither find nor kill fire ants. There is no doubt that Australia needs to continue the war on fire ants. The long-term costs of fire ants on Australia’s unique wildlife and environment, outdoor lifestyle and clean agricultural products will be in the billions of dollars each year. For Australia to win the war against fire ants, the fire ant program needs to be removed from Biosecurity Queensland and managed by a scientifically based, competent, independent biosecurity agency. When fire ants were detected in south-east Queensland in February 2001, the biggest infestation was centred on the electorate of Minister for Agriculture, Henry Palaszczuk. Fire ant infested businesses in his electorate had to close. Residents were being stung. Minister Palaszczuk was under pressure to act and fighting fire ants would become his greatest political challenge. 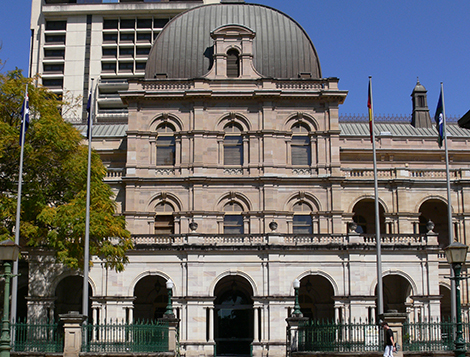 A long time back-bencher, in 2001, Palaszczuk had only recently come onto the Ministry. But he had been a Minister long enough to know how much Commonwealth money came into Queensland to eradicate a pest of national significance. He knew just what he could do with a large injection of Commonwealth funds. The ALP government of Peter Beattie had just won a landslide State election on the promise of ‘Jobs, Jobs, Jobs’ when the State’s unemployment rate was running at 8.5%: even higher in Minister Palaszczuk’s electorate. An injection of Commonwealth money into the State would go a long way in creating a huge jobs program. In May 2001, with the prospect of Commonwealth money in mind, and before any scientists had assessed the extent of the Queensland’s fire ant infestation and made recommendations on the best course of action, Minister Palaszczuk declared that Queensland would eradicate fire ants. In June 2001, three fire ant experts from the USA said that the infestation in south-east Queensland was as bad as, or worse, than anything they had ever seen in the USA. They described South-East Queensland as ‘fire ant heaven.’ No country that has been invaded by fire ants has ever eradicated them, so the US fire ant experts were ambivalent about Queensland’s chances of doing so: but were not about to contradict a local politician. So, they said Queensland had an outside chance of eradicating fire ants if the State went after then ‘hard and fast’ with ‘aggressive containment’ to stop people from carelessly moving fire ants in loads of soil or mulch or pot plants, and with ‘intensive baiting’ of the whole infestation with a low toxic bait; most effectively by air. Minister Palaszczuk rejected their advice. He had already caved into industries who had pressured him into allowing them to manage their own risk of spreading fire ants rather than comply with an aggressive containment regime. And besides, the Commonwealth would not fund a containment program, only an eradication program. Many community minded businesses and residents took care to make sure they did not spread fire ants. Many did not, so fire ants spread. Aerial baiting of the whole area of the infestation would have been the cheapest, quickest and most efficient method of treating the whole infestation. Minister Palaszczuk rejected this advice in favour of creating a huge ground force of four hundred unskilled, unemployed people, many from his own electorate, to search for and kill fire ants. Like allowing businesses to self-manage their risk of spreading fire ants, this too was a disaster. In a program that relied on having feet on the ground, team leaders struggled to mount functioning teams when a significant number of field assistants could not read or turn up to work regularly. Program auditors said the biggest drain on the program’s efficiency was a slow, inefficient, unreliable workforce. Fire ant experts from the USA said Queensland had an outside chance of eradicating fire ants; but only if the State went hard and fast. Minister Palaszczuk’s ground force took two years to get the first round of bait down. So, fire ants continued to spread. The scientists who reviewed the fire ant program in 2002 were appalled at the program’s lack of a sense of urgency and had doubts about the program’s ability to eradicate fire ants. They made 23 recommendations for addressing the program’s many problems and said that if fire ants were not virtually eradicated by the end of 2004 the eradication program should be terminated and replaced with a containment regime. Consistent with Minister Palaszczuk’s approach to scientific advice, none of those recommendations were implemented. Three subsequent scientific reviews had similar fates. The Science Manager of Biosecurity Queensland’s fire ant program threatens that the war against fire ants might be lost if Queensland is not given more money. He knows that Commonwealth money is uncertain, because, as the Capability Review of Biosecurity Queensland said in 2015, Queensland cannot give funding bodies a good case for future funding because Biosecurity Queensland has no performance data and has wasted funds in the past. Minister Palaszczuk and all subsequent Ministers need to be held to account for failing to administer legislation that makes it illegal to move a fire ant. Minister Palaszczuk and all subsequent Ministers need to held to account for wasting $350m of public money. For Australia to win the war on fire ants, the fire ant program needs to be taken away from Biosecurity Queensland and given to a scientifically based, competent, independent biosecurity agency. Fire ant fact check: Two incursions eradicated. Really?